New congregations to join the UUA? I had been waiting for the UUA Board agenda and packet for their meetings that surround General Assembly; they published them last night. Why? To see what great things the UUA is planning? No. Something simpler. Will there be a new member congregation celebrated at General Assembly? Not that many years ago, welcoming new congregations was quite the event. Pictures of smiling faces, maps pointing out the new starts and delegations on stage. Then fewer. Then one. Last year, none. The last congregation to join the UUA was two years ago, the Unitarian Universalist Fellowship of Benton County, Bentonville, Arkansas. Meanwhile a few others, all very small, have since disbanded or disaffiliated. I have my opinions why this is the case, and no, the covenanted communities aren’t a replacement, but I’m not keen on shouting into the wind. Instead, I’ll say thank you to the people of the recently-disbanded Peter Cooper Fellowship, Memphis, Tennessee (as noted in the packet) and wish them well for whatever the future brings. Because there’s nothing like celebrating Holy Week then discovering other people in your denomination denounce Christianity with such a broad brush. What a punch to the gut. Shame on you. And before someone pipes up by saying “Oh, surely that’s those bad Christians and not you good Christians”, I’m not buying such an easy distinction. Because in this of all years, and after 30 years of minimizing, sidelining comments by other Unitarian Universalists, a plausable denial of Christian bating — or any coded insult to any group — won’t fly. Christians are the only religious group that Unitarian Universalists regularly and freely denounce. Christians are the only religious group who have their acceptance based on the condition of being similar to other Unitarian Universalists. The option to be a bland and domesticated version of Christianity in no option, but a double standard, and sickening besides. And if forced to choose, I will always choose the body of Christ, which understands sin, repentance, forgiveness and grace. And, unlike the Unitarian Universalist Association, isn’t likely to worry and convulse itself to death. For reasons too long to go into now, I was tracking down threads in the Classic Reform tradition of Reform Jewish liturgics a couple of weeks ago. Suffice it to say that it was in parallel with some of the liturgical developments in Unitarian churches in the late nineteenth century. There were some friendships crossing the divide, or at least cooperative parterships. It’s hard to tell how far or wide without a deep dive. As well it should. Capitalization aside, the first part of the Aleinu was dropped in almost verbatim as the Exhortation — that is, a beginning sequence — of the First Service of the Services of Religion, the services prepended to the 1937 joint Unitarian-Universalist Hymns of the Spirit. Let us adore the ever-living God, and render praise unto him who spread out the heavens and established the earth; whose glory is revealed in the heavens above and whose majesty is manifested throughout the earth. He is our God and there is none else; wherefore in awe and wonder we bow the head and magnify the Eternal, the Holy One, the Ever Blest. That’s the same hymnal that has the Jewish text translated by a Unitarian minister, “Praise to the Living God” as its first hymn. And if you’ve read this far and are at the UUA General Assembly in New Orleans, you may be interested in Shabbat Worship, presented by Unitarian Universalists for Jewish Awareness on Friday, June 23, 5:00 pm in the Hilton Riverside Windsor Room. GA Planning committe recommends Providence for GA 2020. I’m soft-launching my new project, the Universalist Christian Initiative at the Unitarian Universalist Association General Assembly, which begins today in Columbus, Ohio. It’s mainly about creating resources and finding direction for Universalist Christians, and at this point I’m looking for people interested in this work. Please join the newsletter list here, and follow our Twitter account (@universalistci) here. Thursday, Jun 23 from 1 p.m. to 2 p.m.
… or send a direct message to the @universalistci Twitter account if you’d like to talk. I’ll be at General Assembly in Columbus; want to meet? The title says it all. 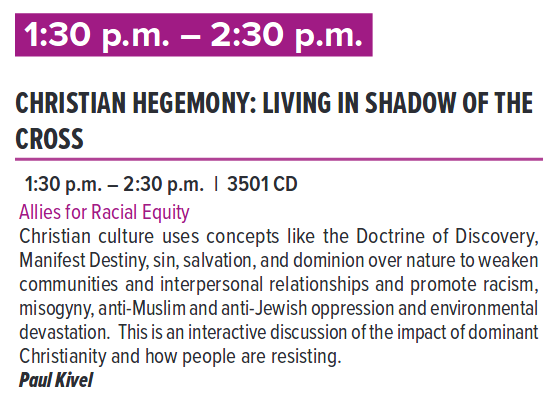 If you are attending the Unitarian Universalist Association General Assembly in Columbus, Ohio and would like to meet and speak with me — say, about approaches to Universalism or church devolopment — I’d be happy to set aside some time. Be sure to contact me through this page, or follow me on Twitter @bitb. Wednesday, February 3. The deadline was pushed back, so today is the last day to certify, if you’re in one of the 148 remaining congregations! I’m fond of certification time for the UUA. It’s when I get new data to analyze. But for congregations, it’s an important annual task. Without it, no voting representation at General Assembly. And I’ve noticed that churches that don’t tend to register are often not long for this world. Don’t tempt fate; certify. All congregations must have filed for certification by 5 p.m. PST on February 1, 2016, in order to be certified for GA. Only certified congregations may send voting delegates to the 2016 General Assembly. There are 383 uncertified congregations right now. I know many will certify over the weekend. Don’t let yours be left out. A couple of weeks ago, I was batting back and forth with an informed Unitarian Universalist friend about our polity, when at one point he zeroed in at the settled clergy vote at General Assembly, at which point I had to stand up for the Universalist contribution to our polity. This is my side of the discussion, which I admit was a bit of a monologue at that point. I don’t have his permission to share his side, but if commenters want to continue the conversation, I would consider it an honor. With the one-way push to regions, will there be an opening for devolution of connection authority? — congregational membership, mission planning, ministerial fellowship [at the regional level] — now that there aren’t 19-22 districts. [After all,] There’s a lot more embedded Universalism in our system than we sometimes credit. It’s about fellowship, not credentials per se. Makes more sense in the Universalist sense if the other piece was still in place. That is, the fellowship of the parishes. That’s because, from a Universalist frame, the UUA acts (imperfectly) as a national church, something the Unitarians would never have. The names tell you all. The American Unitarian Association and the Universalist Church of America. And why scant resources went to build a Universalist National Memorial Church, but the Unitarians never did. To finish my thought, the churches were (supposed) to have a parallel relationship to their conventions that the ministers did, supervised by the same committee. And both ministers and lay persons served on them. Not that I’m all rah-rah retro Universalist. The half-time service requirement for fellowship renewals — a thorn in my side — is a re-write of a pre-consolidation Universalist rule. I stumbled across the webpage of the Unitarian Universalist Association General Assembly, which talks about — in broad terms — next year’s convention. It’ll certainly be less expensive for more people than last year’s (Portland, Oregon) and possibly than 2017 GA in New Orleans, as Columbus is a lower cost city for hotels and nearer the population centroid for Unitarian Universalists, which is in Illinois. I hope to be there. So what great plans can we make with the opportunity?